Welcome quilters to Day One of Kay Mackenzie’s blog tour for her newest book, Inspired by Tradition: 50 Applique Blocks in 5 Sizes. If you’re new here, allow me to introduce myself. I’m Maria Peagler, author of the Benjamin Franklin award-winning book Color Mastery: 10 Principles for Creating Stunning Quilts. I’m a workshop instructor and I’m thrilled to have a book like Inspired by Tradition for my students. Watch my video review of Kay’s newest title, then read on for how you can win you very own copy. Want to learn more? Check out all 50 blocks at Inspired by Tradition’s Amazon page. Check back daily at Kay’s page from March 23 – March 31 to see who will be hosting Kay on their blog. Want to win your own copy? Just spread the word about Kay’s new book, by sharing this page with your friends, sharing on Facebook, Twitter, or sending an email to your guild’s Program Chairperson or Newsletter Editor. I make it really easy: simply click on any of the icons at the top or bottom of this post to share on your favorite social network or via email. Then tell me here in the comments how you shared, and you’ll be entered to win. Check back tomorrow when I’ll announce the lucky winner. This entry was posted in applique, Artist Dates, Books, Learning from the Masters, Quilting and tagged applique, book, Quilting on March 22, 2011 by mpeagler. I want my work to last. Longevity is one of the three main goals I have for my books. The other two? A post for another day. I realized long ago that it took just as long to write a book that was trendy and out of print after two years as it did to write a classic. 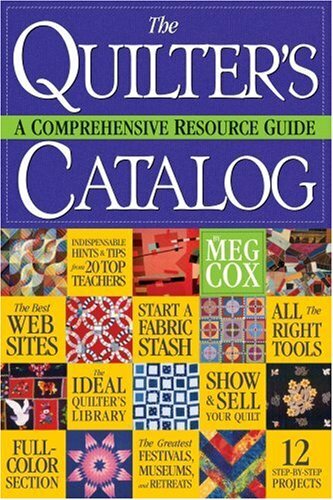 And as a quilter and artist, I appreciate books that provide me with lessons for years to come. I often hear people complain about how expensive books are, which is why I go for those that provide me with lasting value. I enjoy patterns, booklets, and other fun diversions. But they don’t have the lasting value of a book. Color Mastery has nine quilt projects. If you bought them individually in a pattern, each would average $15.00. Multiply that times nine and you get $135.00. Color Mastery also has 11 exercises, and has twelve months worth of class material. I teach shop owners how they can offer a different class each month using the exercises and projects in the book. A full-day class averages about $60.00, and 12 of them would be $720.00. $135.00 worth of patterns/projects, and $720.00 worth of classes is a total of $855.00. Still think a book is expensive? Look’s like the world’s best bargain to me. The real test of a book-lover’s book is this: does it provide those things that make a reader’s life easier, that will make the book last, and makes it easy to find, or get more information? I printed Color Mastery on museum-quality paper using the best photographer and printer in the industry. I included an index to make information easy to find. Look at the latest quilt book you bought: I bet it doesn’t have one. Publishers are skimping on this kind of stuff and betting you won’t notice. Bibliographies too. I want to know how to find out more information when I’m interested in a topic, and I know my readers do too. And librarians love them. Does the book’s binding last? Is it sewn or glued? Color Mastery’s is sewn, of course. And it has a spine, so you can find it on a store shelf or your own. Look for these qualities when you buy a book. Be a discerning consumer. Expect them in your books and ask for them. And support quilt book authors who give you the best. This entry was posted in Artist Dates, Books, Color Lessons, Learning from the Masters, Publishing, Quilting, Sewing Patterns, Workshops and tagged artist dates, biblliography, book, index, Quilting, value, Workshops on June 25, 2009 by mpeagler. I’ve met wonderful women (and men) this week during the first half of the Color Mastery book tour. I’ll be featuring many of these creative folks in future posts and interviews, but here are a few photos first. Debbie and Marie were so much fun. Marie used to work at Olan Mills, and she posed all of us for our photos. You remember the drill: turn to the side, chin up, hands on your lap. We were all giggling during our photo session. Ellen and Kathy are two of the three women owners of Foxtales Book Shoppe in Woodstock. What an AWESOME book store. Really. Wood paneling, comfy chairs, a children’s room, great personal service. Will be on my list of shops to visit regularly. They recommended books for my husband and both of my sons, and they all love them. I had to do some book shopping, of course. Coming up this week and next: Dahlonega, Ringgold, Columbus, St. Simons, and Savannah. Check out the tour map at Google maps and all the details at the Color Mastery book blog. I hope to meet you on the tour! I just talked to Sandi at Colonial Quilts in Savannah, and she was on her way to post a flyer in the local motorcycle shop. She said many women motorcyclists are also quilters. Who knew? That’s a stop I can’t wait to do! This entry was posted in Books, Breaking Quilting News, Color Mastery, Quilting on April 28, 2009 by mpeagler. Welcome to the launch party for Kay Mackenzie’s terrific new book, Easy Applique Blocks: 50 Designs in 5 Sizes from Martingale & Company / That Patchwork Place! I’m pleased to host Kay here at Quilts and Creativity, and to be the first stop on her Book-A-Round blog tour. You’ll get to meet Kay, hear the first-hand dish on her new book on appliqué, enjoy quiltini cocktails and tasty treats (recipes follow), and everyone gets a gift from Kay and a chance to win a copy of Easy Applique Blocks. Wow – what a party! Kay Mackenzie and I first met through our mutual friend and photographer, Gregory Case (The Photo Man for The Quilt Show). 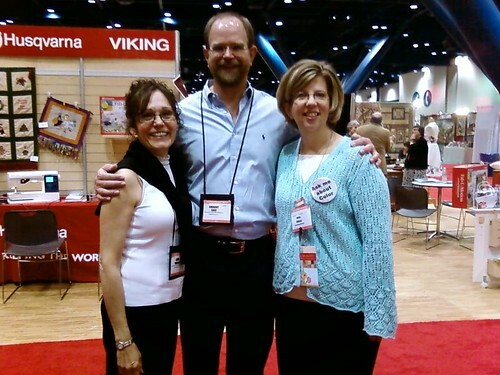 He introduced us and then we ran into each other at 2008 Spring Quilt Market twice! Maria: Kay, please tell us a little about yourself, what drew you to appliqué, and your previous authoring/publishing work. Kay: I grew up in North Carolina, went to school in Colorado, then lived in Los Angeles for a number of years. During all that time I had not one stitch of quilting heritage. I started in a beginning quilting class about 17 years ago after I got married and we were living in central Ohio. When I told my instructor that I enjoyed the Dresden Plate the most out of all the blocks in the sampler, she told me, “You just might be an appliqué person.” I still wonder whether that observation shaped my destiny, because it turned out to be so true! A peculiar combination of interests in my strange brain led me to become an appliqué designer and a publisher of books for quilters… quilting, computer illustration, writing, editing, typography, and page layout all combined! My company is Quilt Puppy Publications & Designs with six titles in print. Up until now my most famous books have been Teapots to Appliqué (now out of print) and Teapots 2 to Appliqué. Quilter love teapots (of course I had to put a couple of them in Easy Appliqué Blocks too). You might ask, who’s the Quilt Puppy? He’s Willie, my little papillon dog! He’s been my boon companion in the sewing room for 14 years now. Willie thinks that boxes of scraps are very comfy. Ever since I started designing and publishing, I had it as a goal to be traditionally published also. I’m so very excited that my flip-side goal has come true with Easy Appliqué Blocks! Maria: What I love about your new book is it gives quilters an EZ Button for applique. So many of my friends and students are hesitant to try the “A” word (as they like to call appliqué), and you’ve given them a no-excuses guide. You offer 50 designs for people who don’t feel confident about drawing their own, each design is in 5 sizes so you don’t have to enlarge or reduce, and you even offer different methods for applique, understanding that no one method works for everyone. Kay: I love that! An EZ button! It’s so true! Easy Appliqué Blocks has a whole library of fresh new appliqué block designs, easy to sew, in a variety of styles ranging from traditional-looking to modern, fun, and whimsical. Something for everyone. Appliqué fans can use their own favorite method, or learn about a new one, because the book includes detailed, illustrated instructions for three kinds of appliqué. For hand stitchers, there’s freezer-paper-on-top and back-basting (aka no-template) preparation, plus information on hand-stitching smooth curves, pointy points, and sharp notches. There’s also an overview of raw-edge fusible machine appliqué. The bonus CD makes it a breeze! It works with PC or Mac. No more more trips to the copy shop, figuring of percentages, distortion, crooked enlarging, or tracing reversed patterns. The patterns print out ‘like butter.’ Stick the CD into your computer and print out the blocks you’ve chosen in the size you want, from 6″ up to 12″. Larger sizes will automatically print in sections that will tape back together perfectly. Reversed versions are also included. Maria: What do you find is the biggest obstacle quilters have with applique, and how have you addressed it with your book? Kay: Yes, the infamous “A” word thing :). I think the biggest obstacle that quilters have with appliqué is when they haven’t been shown the little things that can make a big difference. They spend a lot of time on their appliqué but aren’t happy with the results. That can lead to frustration. In this new book, I share every single thing I know about appliqué, with lots of details and illustrations that will help with smooth curves, pointy points, and sharp notches. The second biggest obstacle is thinking they need to appliqué a certain way, or that one way is better than another. If they prefer handwork, good! If they’d rather appliqué by machine, also good! It’s all good. Maria: How is Easy Appliqué Blocks different from other applique books? Kay: It’s like a block library or resource center for appliqué fans. The variety of designs is right there at their fingertips whenever they need one block or many. I can’t wait to see quilters unleash their creativity and go to town with the blocks! Besides the 50 blocks, the instructions for three kinds of appliqué are great… I’m especially excited about the section on back-basting, because I think that method has been flying along under the radar. And, the bonus CD is such an added value. It was my concept and I’m so happy that Martingale went with it. They did a fantastic job. Mix half cranberry cocktail juice with half lemon-lime or club soda. Stir. Enjoy. Crispy/airy/chewy, delicious and savory bites of flavor! Grate cheese. (For best results, do not use pre-grated cheese.) Cream cheese together with butter. Mix dry ingredients together and add in 3 parts to cheese mixture. Roll into little marbles and place on ungreased cookie sheet. Bake about 12 minutes at 350 degrees. They should not get too brown. Cool slightly on cookie sheet, then transfer to a wire rack to finish cooling. Preheat oven to 350 degrees. Spray a 12-round pizza pan with vegetable oil. Place cake mix, melted butter, milk, egg, and vanilla in a large mixing bowl. Blend on low speed for 30 seconds. Stop, scrape down the sides, and beat 1-2 minutes more on medium speed. Pour brownie batter into pan. Bake for 20-25 minutes. Immediately top with chocolate chips, walnuts, and any other delicious toppings you desire. What’s a Party without Gifts? Kay is giving away an autographed copy of her brand new book to one lucky winner here at Quilts and Creativity. You must comment today by 6:30 p.m. EST to win, and I’ll select the winner at 7:00p.m. Leave a comment telling Kay what sounds most interesting about her book, and the name of your local quilt guild. Good luck! Host your own Easy Appliqué Blocks party at your quilt guild or bee: members bring a completed block from the book, serve the quiltinis, cheese puffs, and brownie pizza, put all the blocks together in a top, and draw names for the winner! What a fun girls’ nite out! Here’s where to find the book: Ask for Easy Appliqué Blocks at your favorite quilt shop. It’s also available from the Martingale website, Amazon, and Kay’s website. Kay: Thank you so much Maria for throwing a terrific party! Readers, thanks for coming along on this first stop in the Book-A-Round. There are 9 more stops to go, so start off at All About Appliqué through April 5 and I’ll shoot you off through the blogosphere to the next location. See you there! Maria: Thanks Kay for stopping by and joining us. Wishing you and your readers much fun and success with appliqué in Easy Appliqué Blocks: 50 Designs in 5 Sizes. This entry was posted in applique, Artist Dates, Books, Publishing, Quilting and tagged applique, author, book launch party, Publishing on March 27, 2009 by mpeagler. My latest newsletter is out and it’s bursting with all kinds of spring goodies, including all the details on the latest Color Mastery news: a book tour across Georgia. All the details are in the newsletter and over at the Color Mastery blog. Every author dreams of doing a book tour, and I can’t wait to meet quilters across the state. That’s my favorite part of quilting: meeting all the wonderful women (and men) who love this historical form of art, expression, and love as much as I do. I’ll be starting in the mountains and ending at the beach. What a beautiful state I’m blessed to live in! And I’ll get to visit with family and friends along the way. If you’d like to subscribe to the newsletter, click the link at the top of the blog. You can see past newsletters in the archives. This entry was posted in Artist Dates, Books, Color Mastery, Newsletter and tagged artist date, book tour, Color Mastery, email newsletter on March 24, 2009 by mpeagler. My younger son announcing the winners of door prizes. He was all smiles, sneaking sweet treats, picking out fat quarters, and giving me hugs throughout the evening. My older son would quietly rub my shoulders as I was signing and talking; he was also the photographer for the evening. My husband David talking to one of my best quilting friends, Pat. They were both so proud and thrilled for me. My friend and cheerleader Kay and her granddaughter. Thank you, Kay, for the wonderful book title! Kay attended a quilting retreat last year at my home, during which I floated several titles for the book. Later that week Kay sweetly suggested several other titles, which were terrific, and Color Mastery was the winner! And finally . . . me. I’m all smiles after all the two years of loving working that went into Color Mastery. It was a night to celebrate it all. Thank you to everyone who came out to support me, Jeanne, and quilting. Jeanne was thrilled with the shop’s sales that evening. I was giddy over the book’s sales, and quilters had a blast eating, drinking, and getting tips about color. I’d be delighted to visit your local quilt shop and do a book signing, lecture, or class. Tell them about the book, and show them the blog. I’ve got a page at the book blog just for quilt shops. I look forward to seeing you at your local shop or quilt guild! This entry was posted in Artist Dates, Books, Color Mastery, Home, Publishing, Quilting and tagged book launch, color journal, Color Mastery, Home, quilt shop on February 23, 2009 by mpeagler. (You’re gonna want to scroll down for this one.) So what does all this stuff about sketching have to do with quilting? It prepares you for the single moment that inspiration strikes. I want to make a quilt of a house, a bird, a cup of coffee. I want to make a bow-tie quilt, log cabin. I can’t wait to use that new fabric. Now you have a rich repository from which to draw images from. You’ve “filled the well” as Julia Cameron would say in her seminal work, The Artist’s Way: A Spiritual Path to Higher Creativity [10th Anniversary Edition] . Here’s one path from sketch to original art quilt. I started with several thumbnail sketches, not really sure how I wanted to capture this gorgeous valley. All the preparation in my sketchbooks readied me for this quilt. Funny, it didn’t feel like preparation. It felt more like time was flying by, being the in flow, capturing the images and moments that held meaning for me. Truly, the best part of being an artist. Dreaming, sketching, and quilting. I love my job, don’t you? Note of interest: The tiny building in the background (best seen in Thumbnail #1) burned to the ground months after I did this sketch. It was a local restaurant that held many memories for me and neighbors in my community. Now it has been immortalized in a work of art. See what I mean by capturing meaning? I had no idea of the unfortunate event that would come, nor do you ever know all the layers a work of art potentially holds. Until you actually create it. This entry was posted in Books, Journals, Learning from the Masters, Quilting and tagged artist dates, Journals, Learning from the Masters, Quilting on August 14, 2008 by mpeagler. At some point in my sketchbooks, I stopped using them as a place for only my ideas and inspiration, but also as a place to capture the daily moments of my life by drawing them. My husband had given me the book How to Make a Journal of Your Life , and it really enhanced my journaling style. Dan Price has been detailing the minutiae of his life for decades, drawing things as simple as the interior of the car as he rides with friends. His drawing style is simplistic and far from perfect, but that’s what makes it beautiful. He’s not attempting to create a masterpiece; rather, he’s making art of his everyday life in his own hand, his own style. I still drew only sporadically until last year, when again my sweet husband gave me another book for Christmas: Danny Gregory’s Creative License, The: Giving Yourself Permission to Be The Artist You Truly Are . Danny begins drawing his days after his wife is hit by a subway train and becomes a paraplegic. Like Dan, he draws the little details that make up our lives: what he has for dinner, his dog, the interior of his medicine cabinet. And he is insistent that you make drawing a daily habit: do bad drawings, sketch things wrongly, but just do it and learn as you go. I don’t sketch daily, but weekly, yes. Sometimes more than once a week. I draw more often when I’m on vacation, as I have more time and I want to remember the places I’ve been and what we were doing. This journal I made by hand, after reading on WhipUp about a great book called How to Make Books (see the link in my sidebar). I made this little journal from old blue jeans, drawing paper and watercolor papers. It is always with me in my purse, and holds my sketches, summaries of books I’ve read, and even my grocery list. It’s a little journal of my life. And now I draw things I would never have imagined as important or even beautiful. But they are beautiful, because they are my life. This entry was posted in Artist Dates, Books, Journals on August 12, 2008 by mpeagler. If you’ve been reading this blog for awhile, you know how passionate I am about color. Now, I’m sharing that passion with you, and giving you a glimpse at the book throughout the week. Color Mastery will be available in your local quilt shop in February ’09. That sounds like a date in the distant future, but it will be here before we know it! I’ll be attending my first quilt market this May to meet and greet with distributors to ensure the book will be available in your area, even if it’s internationally! Note to international readers: send me the link or email for your local quilt shop and I’ll chat with them to find out their distributor who supplies their books. I’m at mariapeagler(at)tds(dot)net. Look for a blog I’m developing that will be solely about Color Mastery. I’ll then be returning to the regular content I do on this site: quilting, creativity, life, and and how they all interact. Next up: Color Mastery’s Table of Contents. Be the first to get a top-secret look into the chapters and projects that will open your eyes to the world of artistic color in your quilts! This entry was posted in Books, Color Mastery, Quilting on April 28, 2008 by mpeagler.